After the success of the CHS girls’ cross country, who won the Mission Trail Athletic League championship, and girls’ volleyball, the first CHS team ever to win two Central Coast Section games, Padre athletes will be competing in a new array of sports this winter: boys’ and girls’ soccer, boys’ and girls’ basketball and wrestling. 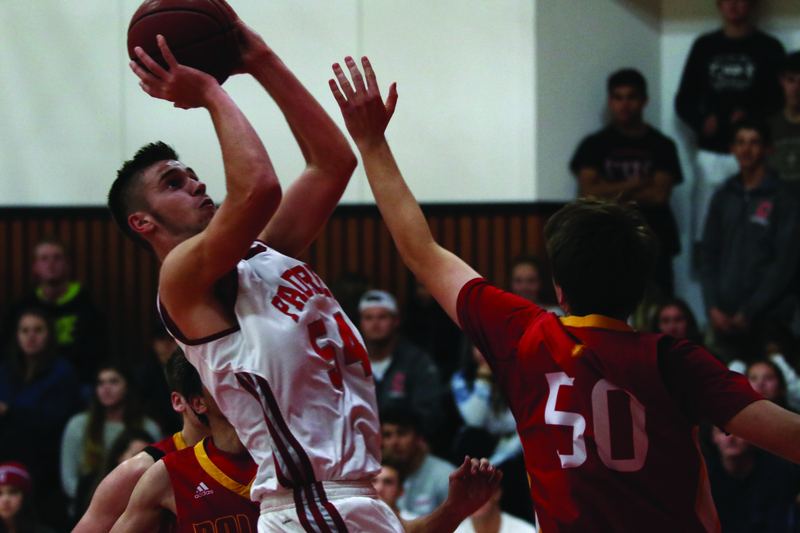 With a 91-53 win over Pajaro Valley to start the season, boys’ basketball is looking to perform even better than they did last year, when the team finished 11-3 in league and made it two games into CCS. The Carmel team features both a number of returning players and strong new players, according to coach Kurt Grahl. Players to watch include senior Kevin Cook, who has scored 48 points this season, senior Antonio Giangiorgi with 13 points; sophomore Kai Lee with 40 points and freshman J.T. Byrne with 61 points. “We will probably be a more interior-oriented team because we have a lot more size and strength than last year,” assistant coach Hans Schmidt says. With the raw power of both the team’s veterans and underclassmen, the Padres have a lot of depth and versatility, and the team is set to have an arsenal of high-performing athletes, according to Schmidt. Going into the team’s home tournament Dec. 15-16, they are 2-1. The fate of the girls’ basketball team remains more in question. The team’s returning members Godon, Ashley Langley and Soana Laulotu will be crucial in scoring points for the team. With all the new players, the team needs strong leadership in order to perform well, according to Suarez. Langley scored 10 points during the Dec. 7 game against Santa Cruz, which the Padres lost 29-41. Before the team’s game against Alisal on Dec. 13, the team was 0-3. The Padres play at Salinas on Dec. 16. CHS art teacher Steven Russell will be taking over for the team’s previous coach Artie Cairel. Russell has coached girls’ soccer at Seaside High for 11 years, in addition to volunteering for two years for CHS girls’ soccer. Boys’ soccer also sports a young team. “Our goalies are either real young or inexperienced, but all are willing to learn,” Russell says. In addition, the loss of 2017 graduates Leo-Gonzalez Smith, Mac Coltelli and Terak Hornik could significantly impact the team’s performance. Despite the loss of the graduates, the team intends to focus on the same general tactical strategy as last year, according to Russell. After the first six games, junior Scott Tracy had the most goals of the team, with 8. Junior Finn Mendez had 6 assists, and sophomore Spencer White had 7 saves. The strategy seems to be working, as the Padres dominated York during the first regular-season game 14-0. Going into the Dec. 12 game against San Lorenzo Valley, the team was 3-3. The Padres play next on Jan. 5 against Marina. The girls’ soccer team lost five graduates from the class of 2017, who collectively won several awards including MVP and Defensive Player of the Year, according to coach Mucho Pefok. “This is the first time I’ve had a really good feeling about the season,” senior Jessica Purdom, a team captain, says. In addition, the team welcomes exercise specialist Rosa Bianca as their assistant coach. After the Scotts Valley game Dec. 7 which the Padres lost 0-4, the team was 1-3. The team’s next game is against Monterey at home Monday at 3:15 p.m.
Wrestling has a new coach, Russell Shugars, who has stepped up up to replace Pete Devloninik, the team’s assistant coach this year. However, the wrestling team is faced with a majority-sophomore team, featuring only one junior and two seniors. “It’s going to be a building year,” Anderson says. The team had an explosive tournament Dec. 9 at the Webber Lawson Memorial Tournament, with junior Kurt Brophy winning first place in the 160-lb. class.